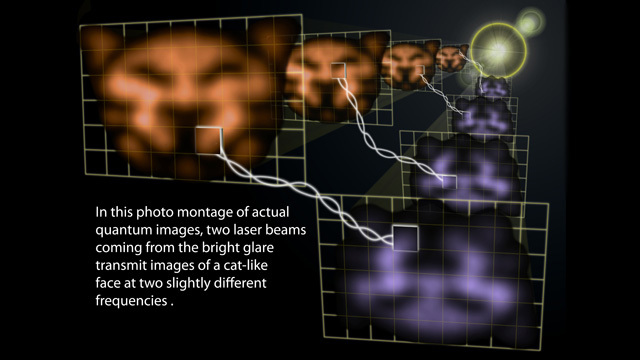 A laser beam (“probe”) first passes through a mask that imprints a visual attern. Along with a second laser beam (marked “pump”), it enters a cell containing a gas of rubidium atoms. Interactions between the rubidium gas and the beams produce an amplified version of the imprinted image as well as a second version of the image, rotated 180 degrees around the pump. 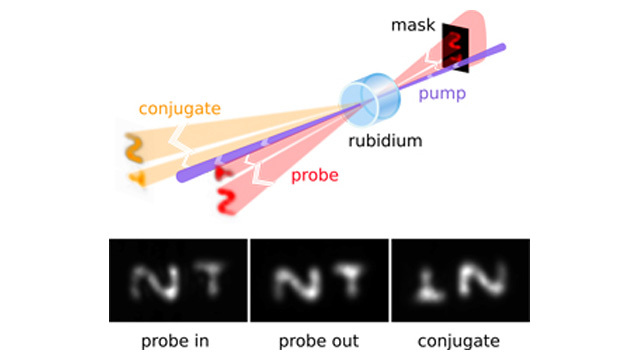 The bottom panel shows, from left to right, an incoming probe beam imprinted with the letters “N” and “T,” an outgoing probe beam with an amplified image, and an upside-down version of the letters. The middle image is “entangled” with the rightmost image; the images’ changes over time are highly related to one another. Lab set-up. P: pump, Pr: probe, C: conjugate, LO: local oscillator, BS: 0/50 beamsplitter, PBS: polarizing beamsplitter, PZT: piezoelectric actuator, Rb: Rubidium vapor cell, SA: spectrum analyzer. Using a convenient and flexible method for creating twin light beams, JQI researchers from the National Institute of Standards and Technology have produced “quantum images,” pairs of information-rich visual patterns whose features are “entangled,” or inextricably linked by the laws of quantum physics. In addition to promising better detection of faint objects and improved amplification and positioning of light beams, the researchers’ technique for producing quantum images—unprecedented in their simplicity, versatility, and efficiency—may someday be useful for storing patterns of data in quantum computer and transmitting large amounts of highly secure encrypted information. The research team, led by JQI’s Paul Lett, describes the work in the June 27 issue of Science. Conventional photographic films or digital camera sensors only record the color and intensity of a light wave striking their surfaces. A hologram additionally records a light wave’s “phase”—the precise locations of the crests and valleys in the wave. However, much more happens in a light wave. Even the most stable laser beam brightens and dims randomly over time because, as quantum mechanics has shown, light has inherent “uncertainties” in its features, manifested as moment-to-moment fluctuations in its properties. Controlling these fluctuations— which represent a sort of “noise”—can improve detection of faint objects, produce better amplified images, and allow workers to more accurately position laser beams. Quantum mechanics has revealed light’s unavoidable noise, but it also provides subtle ways of reducing it to values lower than physicists once imagined possible. Researchers can’t completely eliminate the noise, but they can rearrange it to improve desired features in images. A quantum-mechanical technique called “squeezing” lets physicists reduce noise in one property— such as intensity—at the expense of increasing the noise in a complementary property, such as phase. Modern physics not only enables useful noise reduction, but also opens new applications for images—such as transferring heaps of encrypted data protected by the laws of quantum mechanics and performing parallel processing of information for quantum computers. Perhaps most strikingly, the quantum images produced by these researchers are born in pairs. Transmitted by two light beams originating from the same point, the two images are like twins separated at birth. Look at one quantum continued on next page image, and it displays random and unpredictable changes over time. Look at the other image, and it exhibits very similar random fluctuations at the same time, even if the two images are far apart and unable to transmit information to one another. They are “entangled”—their properties are linked in such a way that they exist as a unit rather than individually. Together, they are squeezed: Matching up both quantum images and subtracting their fluctuations, their noise is lower—and their information content potentially higher—than it is from any two classical images. To create quantum images, the researchers use a simple yet powerful method known as “four-wave mixing,” in which incoming light waves enter a gas and interact to produce outgoing light waves. In the setup, a faint “probe” beam passes through a stencillike “mask” with a visual pattern. Imprinted with an image, the probe beam joins an intense “pump” beam inside a cell of rubidium gas. The atoms of the gas interact with the light, absorbing energy and re-emitting an amplified version of the original image. In addition, a complementary second image is created by light emitted by the atoms. To satisfy nature’s requirement for the set of outgoing light beams to have the same energy and momentum as the set of incoming light beams, the second image comes out as an inverted, upside-down copy of the first image, rotated by 180 degrees with respect to the pump beam and at a slightly different color. Look at two unrelated pixels—for example, a pixel in the top row of the first image and a pixel in the top row of the second image—and they appear to be doing their own random thing. But for two entangled pixels—the upper left pixel in the first image and the lower right pixel in the second image— their random fluctuations over time are eerily similar—one could predict many of the properties in the second pixel just by looking at the first. Previous efforts at making quantum images have been limited to building them up with “photon counting”—collecting one photon at a time over a long period of time, or having very specialized “images” such as something that could only be constructed from a dot and a ring. In contrast, the new method produces an entire image at one time and can make a wide variety of images in any shape. Moreover, those earlier efforts have been difficult to implement—some setups required light to bounce back and forth between tightly controlled, precisely spaced mirrors. By contrast, the fourwave mixing approach requires easy-to-prepare laser beams and a small cell of rubidium vapor. 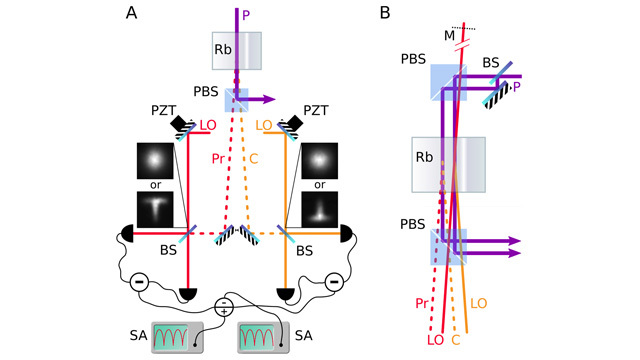 A next goal is to produce quantum images with slowed-down light; such slowed images could be used in information storage and processing as well as communications applications.